How much compensation can I claim for a Sprained Ankle? Ankle injuries, particularly sprained ankles, account for 5% of all Accident and Emergency department visits in the United Kingdom, adding up to a minimum of 5,600 every day, according to research undertaken by Eamonn Delahunt. This number does not even take into account all sprained ankle injuries that do not result in a hospital visit, meaning the actual amount of injuries of this type could be much higher. If you have suffered from a sprained ankle following an accident that was not your fault, it is important for you to know you are not alone. Thousands of other people have suffered in a similar fashion and your suffering can be eased through compensation received through a personal injury claim for sprained ankle. A guide to accident claims for a sprained ankle. What to do if you are involved in an accident causing a sprained ankle. How to begin a sprained ankle claim. What can be claimed for after an accident causing a sprained ankle? Why are sprained ankles so common? Slip trip and fall accidents causing a sprained ankle. The most common ways a sprained ankle is caused. Claiming for a sprained ankle at work. Claiming for a sprained ankle in a public place. Assessing the severity of a sprained ankle. How much compensation will I get after an accident causing a sprained ankle? A sprained ankle injury case study. No win no fee sprained ankle claims. Why choose us as your claims service for a sprained ankle claim? This guide to claiming for a sprained ankle exists primarily to inform you about your potential personal injury claim. The process of such a claim can initially appear daunting and complicated but, with the assistance of our guide and a competent claims service, it could not be simpler. The guide will inform you about what actions you should immediately take after you have been involved in an accident causing a sprained ankle, examine the reasons behind the common occurrences of sprained ankle injuries, and how much compensation you could receive by making your claim. While most people may have suffered from a minor ankle injury (such as a twisted ankle) at some point, these minor injuries can easily develop into a more severe sprained ankle. A sprained ankle will occur when your ankle becomes badly twisted – resulting in the ligaments within your ankle either being strained or torn – and can be extremely painful. However, if you suffer from the aftereffects of a sprained ankle repeatedly over a long period of time, the ligaments within your ankle could become permanently damaged and this could cause long-term pain and muscle weakness. These severe sprained ankle injuries can cause large amounts of pain and can result in many negative consequences, such as difficulties walking or carrying heavy objects. In turn, this could impact upon your job and lead to a loss of earnings. Firstly, you should gather evidence in support of your sequence of events regarding the accident. This could include witness statements from others who saw your accident or even CCTV footage if you are able to access it. This ensures that your claim cannot be refused due to lack of evidence of the accident itself. Secondly, you should find evidence that another party (who you are claiming against) is responsible for your accident and the subsequent sprained ankle injury. For example, if your accident occurred by tripping or slipping on a poorly maintained pavement, then evidence could be found that the local council failed to abide by proper health and safety standards and are therefore responsible. Thirdly, you should ensure that you have evidence to prove the severity of your injury in court. This could include medical reports or scans of your ankle to prove that major damage was done. This evidence is the most important for your sprained ankle injury claim, as the severity of your injury affects how much compensation you could receive as result of your claim. The process of beginning your sprained ankle claim can appear difficult if you have little previous experience with the legal system. However, the process is made infinitely simpler through the assistance provided by a Claims Service, who can make sure that your stress and difficulty is minimised. As mentioned above, the first step you need to take is to gather the evidence necessary to support your claim. This evidence is needed to ensure that your claim is legitimate and can establish any allegations of negligence on the behalf of another party. Evidence typically used can include witness statements describing the accident and medical reports describing the severity of your injury. After you have gathered this evidence, the next step you should take is to contact a law firm such as ours. We’ll include contact information later in this article, should you wish to find out more. After you get in touch, we can arrange for a free consultation session. In this consultation session, we will assess how valid we believe your sprained ankle compensation claim to be and will be able to evaluate its chances of success. This conclusion is based on our years of experience dealing with personal injury claims – especially sprained ankle compensation claims – and the evidence that you provide concerning your claim. If, after this session, you choose us as your Claims Service, we can proceed with preparation for bringing your compensation claim to court. This will involve gathering any additional information surrounding your claim that we can, such as accessing CCTV footage of your accident and arranging a local medical assessment of the severity of your injury. Then we will begin to take your claim to court. Thanks to our ‘No Win No Fee’ policy, we won’t charge you legal fees unless we are successful in arguing your case, giving you the financial flexibility needed to investigate your sprained ankle injury claim without fear. In certain cases, the settlement agreement will be reached before we even get to the court stage of the process. The final amount of compensation will consider a number of factors, as discussed in the next section. General damages – this includes unspecified damages, such as pain and suffering as result of the injury, the effect upon your day-to-day life, and the loss of reputation resulting from the injury. Special damages – this includes measurable damages, such as direct loss of earnings, cost of home-care required by your injury, and damage to property, such as your vehicle. Medical costs – this includes the cost of private medical care or even medical care from overseas healthcare providers, in cases where the treatment you need is unavailable in the United Kingdom. Travel costs – this includes the cost to travel between your home and hospital appointments and potentially travel to foreign countries if treatment is sought from overseas healthcare providers. However, even with the numerous factors which go into any claim, the amount of compensation that you could receive does still depend on the type and severity of your injury. This is as result of the weighting of an ankle injury compensation calculator or soft tissue injury compensation calculator being predisposed towards the severity of an injury when determining your compensation. Learning more about the nature of ankle injuries can help explain why. Sprained ankles – and by extension all ankle injuries – are among the most common injuries experienced in the UK. This is especially true of inversion ankle sprain injuries, which are the most common type and are caused by soft tissue damage when the ankle bends rapidly inwards towards your body. This soft tissue is the main reason behind the frequency of sprained ankle injuries. Soft tissue is easy to damage – especially considering how much weight that your ankle supports while you walk – and easy to damage badly, especially if you have suffered previous sprained ankle injuries. A trip or fall can lead to a twist or sprain, as can being involved in sports or outdoor activities. It can happen as the result of a car crash or an accident in the gym. This will be discussed in the next section. Although the section below covers the main ways that a sprained ankle injuries occur, slip trip and fall injuries require additional comment. The number one most common why that people incur a sprained ankle injury, is by slipping, tripping or falling due to pavement/walkway hazards. In almost every case where a person suffers a sprained ankle due to a slip, trip or fall, there is going to be somebody who is liable. This could be the local council for failing to maintain a pavement, the operator of a supermarket that failed to clean up a liquid spillage causing a person to slip and injury themselves, and any entity which is responsible for maintaining health and safety standards in a public place. If you have suffered a sprained ankle, due to a slip, trip or fall, you can use the contact details at the bottom of this page, and we will help you begin the process of claiming compensation for your sprained ankle injury. Slipping or falling onto your ankle, typically onto an uneven surface. This is the most common cause of sprained ankles. This can result in any severity of sprained ankle injury being suffered by you, and the injuries can result in compensation claims, especially if suffered at your place of employment. Another common way that a sprained ankle can be caused is through sports injuries, especially contact sports such as rugby and hockey. The physical nature of these sports often results in moderate injuries being suffered by those playing. However, you might be right to claim compensation if health and safety standards have not been adhered to by the sports’ organisers. Stepping on uneven ground – particularly uneven pavement – is another common way that a sprained ankle can be caused. In many cases, compensation can be claimed for accidents that have been caused in this way, due to the council’s responsibility to maintain road and pavement standards to ensure accidents don’t happen. 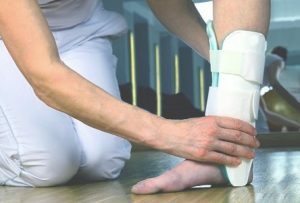 If your sprained ankle compensation claim involves an accident which occurred at your place of employment, further consideration of what you must do should be taken into account for your sprained ankle at work claim. A sprained ankle is one of the most common accidents at work the UK. As your employer has a legal responsibility for the safety of any and all of their employees (and is required to fulfil this by enforcing proper health and safety standards from the Health and Safety Executive) suffering an accident at your workplace can mean your employer could be held responsible. If this is the case, then you will have to make a work accident claim – rather than a personal injury claim – in order to receive the compensation that you deserve for your injury. However, workers compensation ankle injury claims include a 3 year limit from the time of your accident, in which time you are required to file a claim before you are automatically denied any compensation. If your sprained ankle compensation claim involves an accident which occurred in a public place, such as a library or in the street, then different considerations must be taken into account when dealing with your claim. Similar to the responsibility of your employer to ensure your health and well-being, the owner or controlling entity of a public place also has a legal responsibility for your health. They may, therefore, be responsible for paying you compensation. As such, if you attempt to claim compensation for a sprained ankle you suffered as result of an accident in a public place, you need to make a public liability claim. Particularly in a case of injury caused by uneven road or pavement, your local authority or council has a responsibility to maintain the state of such facilities and to attempt to prevent accidents from happening. This means that you could be able to make a compensation claim against said local authority if they acted in a negligent way when maintaining the road and could, therefore, be considered directly responsible for your accident. One of the most important aspects of your sprained ankle injury claim, regardless of whether your accident occurred at work or in a public place, is the severity of your injury. As will be fully demonstrated below, the severity and type of your injury has the greatest impact on how much compensation you could receive. For this reason, we prioritise the assessment of your injury and can arrange a local medical assessment on your behalf. Sprained ankle injuries of minor severity are identified by a tender or swollen feeling in your ankle. There is normally zero or minimal bruising associated with injuries of this severity. Sprained ankle injuries of moderate severity are identified by mild bruising surrounding the ankle. Additionally, moderate tenderness can be felt around the ankle and the victim experiences difficulties walking. Severe and very severe ankle injuries are identified by a complete instability and inability to walk, alongside severe bruising on the ankle. As shown in the table, the type and severity of your injury has a considerable impact on your compensation claim. This is why our company places so much focus upon properly evaluating the extent of your injuries, even offering to arrange a medical assessment with a doctor local to you. We often find that the discussions surrounding potential legal claims can be clarified with the use of a case study. By providing a real world example, we can illustrate the path along which your claim may proceed. In this instance, we can provide you with the story of a client who injured their ankle and sought compensation as a result. This claimant suffered from a minor sprained ankle after falling through a hole in the floor of their workplace. After an investigation, it was determined that their employer had failed to properly repair the hole. The result of this failure to address the issue was the accident which caused the ankle injury. The employer’s responsibility, combined with the minor severity of the claimant’s injury, resulted in a £1500 sprained ankle insurance claim payout. While obviously individual ankle injury settlement amounts can vary, this case still shows how your sprained ankle injury claim might follow along a similar path. In this instance, the payout awarded (and, indeed, the injury itself) were relatively minor. However, much larger payouts and much more serious injuries can often be handled in the same swift fashion. When you begin your sprained ankle injury claim, you may be afraid of the potential costs that you could incur. The legal fees that are commonly charged by other Claims Services can be incredibly damaging to your financial and mental stability. If you are already experiencing financial issues as result of your injury, such fees can seem extortionate. Even worse, the fees that you are charged may even exceed the compensation amount you receive, placing you in a worse situation than previous to your claim. Our company can offer a different approach in the form of our ‘No Win No Fee’ policy. This policy, legally referred to as a ‘Conditional Fee Agreement,’ provides a solid base for any claimant seeking compensation for an ankle injury claim. Payment is taken from the final compensation amount, only in the event that you win your claim. As a result, there is no upfront cost to worry about and no threat of legal debts should your case be unsuccessful. If you want to win compensation, it can be the most financially viable means of securing professional legal assistance. If you decide to move forward with your sprained ankle injury claim, you will need the strong support of an expert Claims Service. With this in mind, our company is ideal. We can assist you in maximising your claim and ensuring that you receive the compensation you deserve. Our years of experience in dealing with personal injury claims ranks us as one of the most capable companies for dealing with sprained ankle injury claims. This experience has given us a deep understanding of how to maximise your chance of being successful in your compensation claim. Our team has a long history of dealing with personal injury claims, which ensures our ability to deal with your compensation claim professionally and efficiently. We leave nothing to chance or luck. We are there at every stage of your claim and can provide premium advice on how to handle your claim. Our commitment to client satisfaction is second to none. This commitment is highlighted through our offering of local medical assessments, our ‘No Win No Fee’ policy, and our free legal consultations. We are by far the best company to help you when dealing with a sprained ankle injury claim and maximising a ankle injury claim amount. When you need a Claims Service, we’re the obvious choice. If you believe that you have a legitimate sprained ankle injury compensation claim, you need to contact our company as soon as possible. You can begin the process using the contact form provided on our website or by calling 0800 073 8804 now. Once you do this, we can provide the legal expertise you need to win your claim. Have you suffered sprained ankle injury due to a slip trip or fall? Find out how to claim. Sprains and strains are injuries that affect muscles and ligaments. If you have suffered sprained ankle from a accident at work you could claim compensation.